Synoptic scale low in north-central KS, with intersection of trough line and old outflow boundary over south-central Nebraska. Our target area is outlined in blue box. We started in Scotts Bluff and headed toward northern edge of intersection of outflow and trough-line, near Hastings, Nebraska. Forecast hodographs showed excellent low level turning of the wind, but with marginal speed shear. An incoming jet streak was expected to strengthen the anvil level storm relative flow considerably, although the low level shear profile was weak. We felt that the risk of LP supercells was high in the box, alhtough SPC never really outlooked the area nor did they issue any watches of any sort. The first storm we encountered was north of Hastings, Nebraska. It was briefly supercellular. A second storm formed on the south side of the outflow boundary of the first, about 20 miles south of Hastings. This was also briefly supercellular. Both of these storms evolved quickly to HP supercells, telling us that the lower mid-level weakness in the wind field still existed. Each these storms had severe hail associated with them and were warned for. Another storm formed on the south flank of this storm (not shown) and went through the same metamorphosis. Yet another storm formed south of this one, by this time very near Interstate 70 in Kansas. This was to become the Salina storm. Now we were getting within shouting distance. 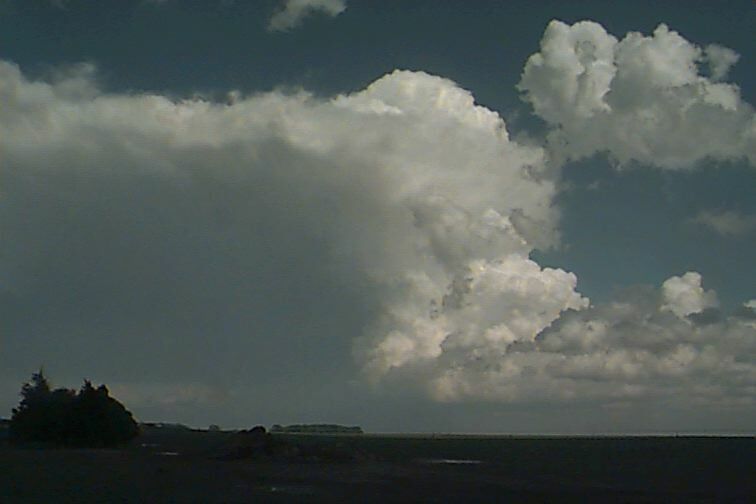 The storm had a wonderfully textured updraft and, occasionally, a beaver tail (evident in formative stages to right). Had to stop and take a picture of the chase group when we were about 15 miles east of Salina. As we approached Salina, the main mesocyclonic cloud structure began to develop small cloud tags, and lowerings, including a couple of funnel clouds. A tornado warning was issued for the storm.